last night at the closing of the Savior of the World play, Hawke began to cry. not tantrum toddler like, but genuine mourning tears. “i want to see baby Jesus” he started repeating in a soft voice. with the closing of the play, he was certain he had missed out on one of the most special moments he might ever have. we walked around to find Jesus’ mom, Mary. spending just a moment with Hawke, she replied, “i can tell this is really important to you. can you wait here?” she left the mass of people standing to meet her, and returned with baby Jesus in arm so the young boy in front of her, who longed for this sacred opportunity, didn’t miss it. Hey! 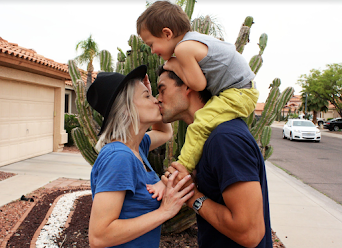 I'm Mandie, I breathe in Phoenix, AZ with my husband, Ric and baby boy. This is my life living fully with Cystic Fibrosis, and trying to balance everything else. Enjoy the good (looking husband), the bad (writing) and the ugly (cry) - cause I tell it all. Thanks for stopping by.